The first Jelly Bean update for the Galaxy Tab 7.0 Plus GT-P6200 started rolling out back in March this year. The firmware released then was branded and was meant for A1 users in Austria. Samsung has now released some more firmwares for unbranded Tab 7.0 Plus that can be installed on any carrier unbranded device, no matter from what country or region you belong to. Since the Android 4.1.2 Jelly Bean update is already rolling out, you might also update your Tab 7.0 Plus via Samsung Kies or on-device software update feature. In case you do not find the update notification, you can download a firmware from below and install it manually using the easy installation guide. The new Android 4.1.2 Jelly Bean update bring most of the features on the Premium Suite Upgrade from Samsung and introduces several new feature and improvements such as the Nature TouchWiz UX, Google Now, new Notification Panel, smoother UI (Project Butter), Samsung Cloud service, Blocking Mode, new Lockscreen, new AccuWeather, varois new apps and much more. The least of new features and changes is enough to show that it is a major upgrade that’ll completely enhance your experience with your Tab Plus GT-P6200 and revive it. Download the firmware from above and unzip it. Charge your device to have at least 70% battery level. Turn on USB Debugging on your Tab 7.0 Plus: Settings> Developer Options> USB Debugging. Turn off device and boot it into Download Mode: press and hold Volume Down+Power buttons together till you see a warning screen. Press Volume Down to continue to Download mode. Now launch Odin and connect your device to computer. Wait till the ID:COM turns blue and you see “Added! !” at message box. Click on PDA button and select the file with .tar.md5 extension found in the extracted firmware folder. Do not touch anything else on Odin and click on Start button. Wait till the firmware is flashed, which is indicated by PASS! message, and then your device will reboot. You can now disconnect the cable. When your Galaxy Tab 7.0 Plus GT-P6200 boots up, it will have the new 4.1.2 firmware installed on it. To verify, open Settings> About. In case the device is stuck on bootloop, follow the steps under Method 1 from here. My phone is Globe phone and im from philiphine what firmware can i use for this Please help me …. 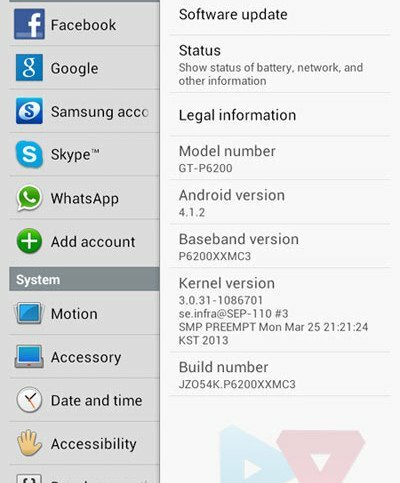 where can I find the 4.0.4 ics firmware for galaxy tab version P6200XXKK6? hello, I hav gt-p6200 wid 3.2 honeycomb….can we still install the 4.1.2 firmware? n which region’s firmware should I install is I m from oman? Which firmware i have to download.. Try a firmware wit a different version of Modem. Which firmware are you looking for? Try a data factory reset. If i install philippines (globe) the device will be globe locked? How to downgrade to original firmware? as hotfile is banned by US gov. I’m in South Africa, which firmware download should I use? I tried with Open Austria & it returned a fail. You can try the Russian version, but before doing that, try reinstalling the same firmware first. And if you got the failed error in the first attempt, it could be due to some other reason. Please check if you have not made any other mistake while installing it. the original android 3.2 firmware. thanks. just installed on my tab 7.0 plus. brilliantly easy! why my tab always fail to update?? i already follow the instruction given but still fail to update. Im from malaysia btw.. I already download firmware for malaysia update. is it ok for me to download others country firmware update?? Just updated the post with three firmwares for Philippines. If you have non-carrier branded device, you can install the one for Indonesia, Malaysia, etc. can i update the firmware without using a PC? If an update is available from Samsung for your device and region and you have not rooted the device, you can update it via Kies or from Settings> About> Software Update. Is your device carrier unbranded? Updates are meant for improving performance and adding features. aia have not heard about any negative effect of firmware update. Does this work on the sgh-t869 as well?